Even since we saw some glass fusing with plant material I have wanted to have a go. Time, the garden, and the bees have conspired to thwart our attempts to find the couple of hours needed to try it out, but, with the nasty weather over the last few days, we decided that today was the day. A little online research brought up about 4 different techniques to cope with the basic problem that, at 800 degrees, the temperature required to melt the glass, all plant material will have turned to carbon. 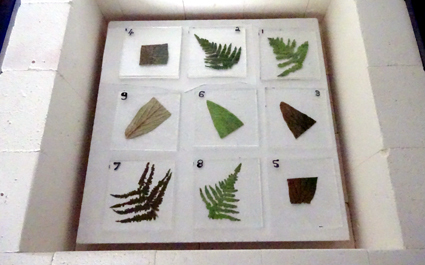 This picture shows the 9 different test pieces, all slightly different, to determine the process that works best for us for different leaf types. Come back in a couple of days to see the results. In the meantime keep your fingers crossed. It has been a while since I last posted. The garden is in full swing and harvesting the soft fruit (blackberries, blueberries, redcurrants, blackcurrants, gooseberries) has been my priority. it has truly been a bounty this year ad we haven’t even started on the apples and plums. Squashes and courgettes are also getting underway and the garlic needs digging up, so you get my point, food comes first. Having said that, the bees have also been busy. We have completed the first extraction of the year and the bees in the long hive are doing well. 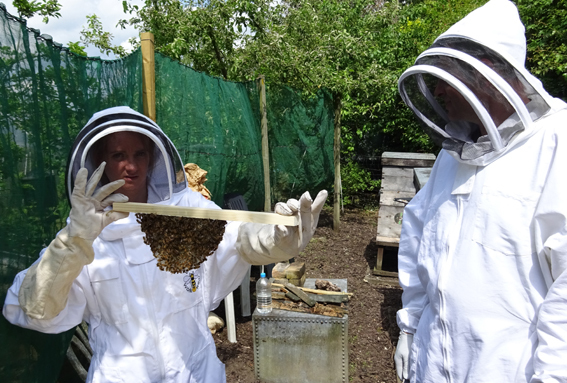 Here is one of the long hive frames, as seen during a recent beekeeping experience day. They are pulling out the comb to fit the V shaped hive and have built up 6 frames already. I’ll try to post some more detailed pictures soon, but that’s it for now.